Home > 2015 > 08/17 > How to build a contender – Part 1: WAR, what is it good for? How to build a contender – Part 1: WAR, what is it good for? A couple weeks ago I took a look at a new metric, Goals Above Replacement (GAR), developed by the team at WarOnIce.com. The concept is a simple one: we can measure the contribution of each player quantitatively by comparing them to a replacement level player, which is a player who is available for a nominal cost via free agency, waivers, or in trade. The goal is to create a single currency to compare all parts of the game, with the best level of data available. 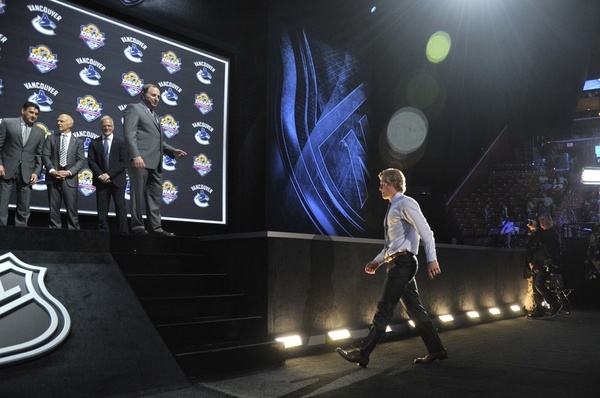 In a recent post post I took a cursory look at GAR from the perspective of what it may project for the Canucks next season. What I found was a statistic that not only had a very high correlation with goal differential and team points, but was also reasonably predictive of future performance. Over the course of this series, I’m going to explore what GAR can tell us about building a contender. What Is Goals Above Replacement? Let’s try and simplify this as best we can. Basically GAR attempts to quantify the impact a player has on their teams goal differential by expressing all of their contributions in one number – the goals above (or below) a replacement level NHL player. It’s an attempt – and, of course, a rough one – to combine multiple factors like scoring, goal tending, face offs, penalty differentials, shot differential, and scoring to create a measured value of a player’s season. Adjust for teammates and competition simultaneously, including replacement level players. Separate offensive and defensive contributions. Adjust for usage, including whether a faceoff was won or lost, and score situation. Model separately for each shot danger (low, medium, high), because we know that forwards and defensemen contribute differently between and within these groups. Distinguish between performance (what happened) and talent (what would be most likely in future). If you want to dig further, I highly recommend their posts on faceoffs, penalties drawn and taken, and shooting and goaltending. This isn’t a perfect metric, in fact the team at War-on-ice is quick to point out that there could be improvements in their methodology as it relates to playmaking and defense by incorporating additional factors in their model. That said, in its current form, it’s impressive. In my view, this is an extremely important area of study in terms of hockey management theory, and GAR is currently the best publicly available tool we have to work with. The goal of creating a single measure is a lofty one. In theory, it will give management guidance on matters as far reaching as who to target via free agency, how to structure your salary cap, and potentially provide a blueprint for building a contender. That is assuming the metric actually does what its supposed to do, so let’s test that out. As I discussed in my previous post, we saw the sum of player GAR for a team has a strong correlation to both goal differential, and team points. This intuitively makes sense. The higher the goals against replacement of the players on that team, the more likely the team will win, which effectively means that the stat does what we want it to do, at least retrospectively. 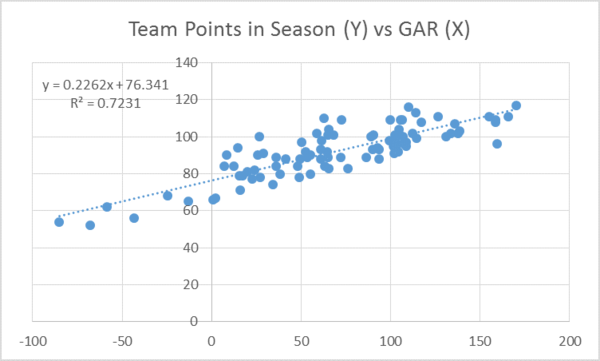 We can see then that there’s a strong relationship between regular season points and GAR. The higher your team GAR, the more likely you’ll outscore your opponent, the more games you win. Interestingly, the 100 point mark and the 100 GAR mark seem to intersect, with the teams we’d probably consider to be contenders to the to the top and right of this point, based on this I was curious to see how the top playoff performing teams did in terms of GAR. To do this, I looked at the 20 teams that made the conference finals over the past five full NHL seasons (2009-10 to 2014-15, excluding lockout year). Unsurprisingly, while there were a number of Cinderella teams to make the final four (Montreal 2013-14, New Jersey 2011-12, Anaheim 2014-15, Boston 2010-11 – ouch! 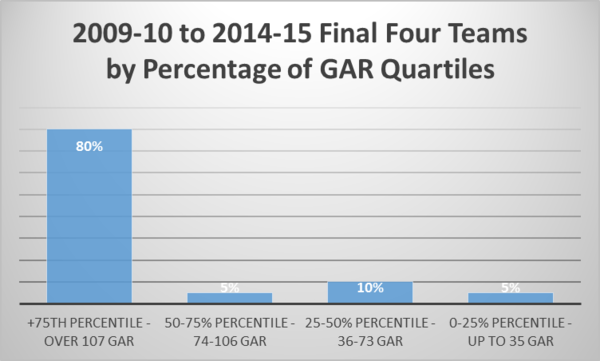 ), 16 out of the 20 teams to make the conference finals over these five seasons were in the top quartile in terms of GAR for this 5 year period, with a team GAR in excess of 107. At the highest level, we can see that teams with a high GAR consistently outscore their opponents – resulting in more wins. Looking at playoff success, the vast majority of playoff contenders in recent years have excelled by this metric, usually as a result of having two to three players who achieve an elite GAR rating. When looking at the data we start to see a demarcation point emerge. If you want to compete for the Stanley Cup all you need to do is acquire a cumulative team GAR of over 107. Simple right? However, its never really that simple, as teams need to consider factors like player aging, contract allocation within the confines of the salary cap, and the scarcity of elite GAR players. I’ll touch on each of these topics throughout the remainder of this series. This tells me that what I have to do is wait till the end of the season to find out if my team makes it or not. I thought you had a new editor. What is a he team? Looking forward to seeing your predictions on both the Canucks outlook re:GAR and who you predict will make the playoffs based off of it. This was a bit of a tease article, but i am looking forward to the series.